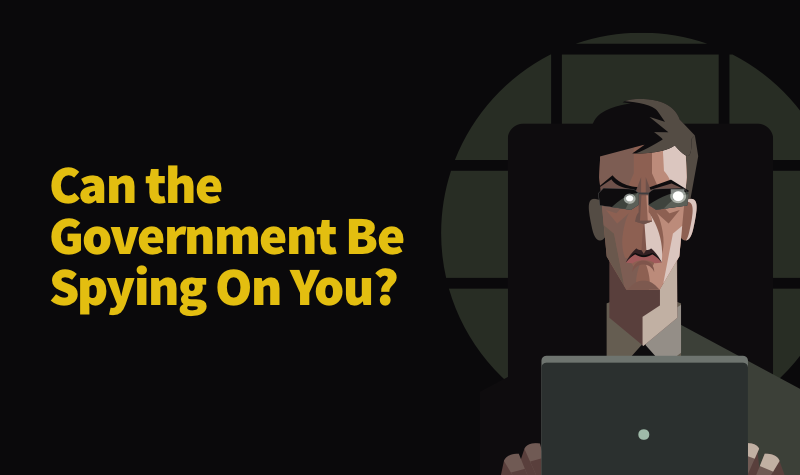 Can the Government Be Spying On You? Which Governments Are Spying On Us? There are tons of movies (The Bourne Identity et al) portraying government organizations with wall-to-wall screens showing a target’s every move, while hackers monitor everything from computer activities, to phone calls, physical location, etc. Is this fiction or fact? Can organizations spy on our every move and invade our privacy to such an extent? Well, technically, they can. While most organizations are looking for specific information (terrorist activities, etc.) they can access anyone’s sensitive information. The U.S. National Security Agency (NSA), for example, is often in the spotlight for everything from violating surveillance limits, to being hit by major cyber-attacks, clashes with the Shadow Brokers hacking group, and more. The other most prominent government organizations are the UK’s Government Communications Headquarters (GCHQ), the Communications Security Establishment Canada (CSEC), the Australian Signals Directorate (ASD), and New Zealand’s Government Communications Security Bureau (GCSB). Flash back to our Bourne Identity example — protagonist Jason Bourne steps off a plane in Moscow and is tailed by Russian agents (FSB? ), logs into a computer in Paris and is hacked by the French intelligence (DGSE? ), jumps on the underground in London and is picked up on a street cam by U.K. govt. officials (GCHQ?). It may seem over the top, but it’s not far from the truth. The NSA, GCHQ, CSEC, ASD, and GCSB are part of the “Five Eyes Alliance” and frequently cooperate on spy programs. For nearly 70 years, this post-war coalition has been building a global surveillance infrastructure to “master the internet” and spy on the world’s communications, as was reported by Edward Snowden — the U.S. computer whiz, former CIA employee, and ex U.S. govt. contractor who in 2013 copied and leaked classified info from the NSA. If you haven’t heard of “SORM,” Google it. Just before the 2014 Winter Olympics — as athletes, spectators and journalists descend on Sochi — the FSB used “SORM boxes” to spy on what everyone was saying. Aware of the boxes, the U.S. Department of State warned those headed for Sochi to leave their electronic devices at home; not to connect to local ISPs at coffee shops, hotels, etc. ; to change all passwords before and after their trip; and to “assume any electronic device you take can be exploited.” Developed at the beginnings of the Cold War (when only phone calls were monitored), SORM can now watch all kinds of communication from emails to texts, etc. Very Bourne Identity-esque! This “Big Brother” activity could not be carried off without help. Governments can demand that technology companies release your private information. While said companies don’t want to snitch on their customers, they may have no choice. Marissa Mayer, CEO of Yahoo (which has complied with government info requests), says that executives who reveal government secrets can face jail time. In the past, Google has petitioned for greater transparency, but the annual “Who’s Got Your Back” privacy rating by the Electronic Frontier Foundation (a civil liberties group that rates companies’ protection of their users’ data from government surveillance and censorship), says Google has lost its bragging rights as the leader in fighting government data requests. The lowest performers were WhatsApp, AT&T, and Verizon. Given the vast hoard of information Google collects on its users (e.g. Google knows nearly every Wi-Fi password in the world), this is disconcerting. A recent article by the Guardian says the daily surveillance of the general public conducted by Google, along with Facebook, is far more insidious than anything the GCHQ gets up to. Ask yourself “how safe is my password?” Keep passwords long, strong and unique and change them frequently. Also, don’t use the same password everywhere. When visiting a web page make sure your communiqué is encrypted (there will be a green padlock and an “https://” not http:// in the URL). Use a plugin like HTTPS Everywhere to guarantee you connect via HTTPS wherever possible. Browse through a Virtual Private Network (VPN), especially in order for safe surfing on public WiFi. Go incognito (aka private browsing) — browse whatever you like without worrying about deleting your history or cookies. Use technology companies that encrypt your data, such as SpiderOak instead of Dropbox; DuckDuckGo instead of Google; and chat with OTR rather than Skype. Look for technology that uses end-to-end encryption, which ensures that your data only gets decrypted once it’s opened by the recipient and not by tech companies who could pass it on. Don’t become a victim of the clickbait trap! What is clickbait? Those alluring headlines and links that make you reveal personal information, risking you to malware, phishing scams, and more. While government surveillance organizations may have the resources to hack every computer, it is unlikely they’d do so. However, if everyone made hacking more difficult, and hence more expensive, we’d all be more likely to protect and maintain our privacy!